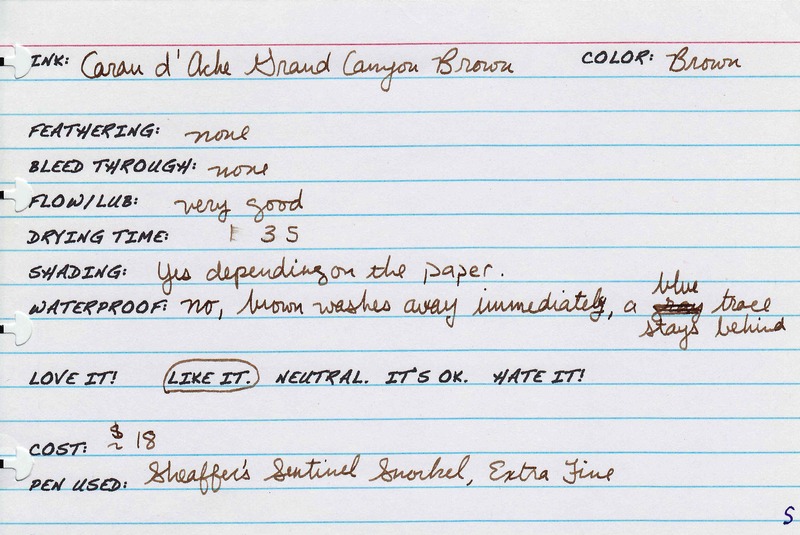 Iroshizuku Yama Guri vs. Caran d’Ache Grand Canyon Brown? Firstly, let me apologize for how long it is taking for me to get these reviews/comparisons up. I intended to do 3 a week, but they have turned out to be a lot more work than I bargained for. In addition, I’ve had some unexpected health distractions come up, so I’ve been away from the blog for about a week. I’m also in the middle of a move, so I’m going between two places that are 3 hours apart. I’m presently stuck at one of those places while all my review materials are at another place! 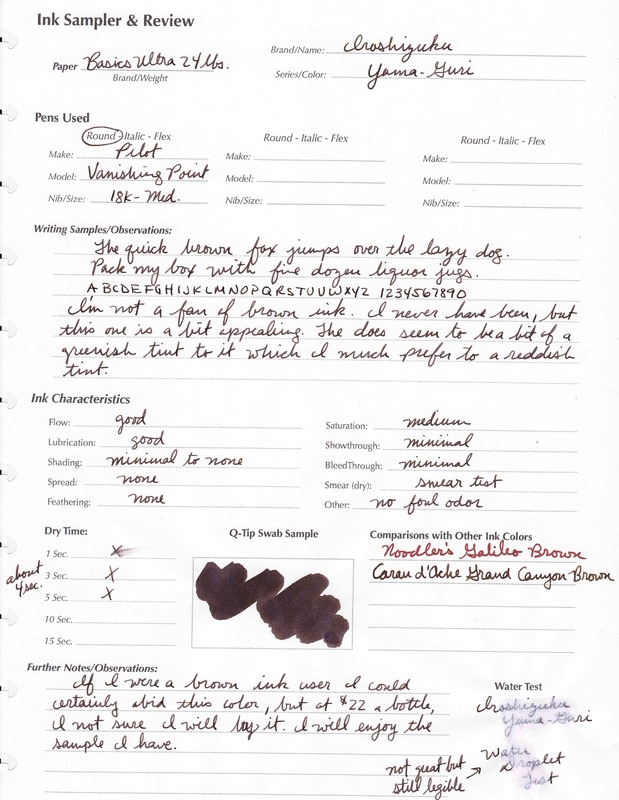 This set of scans is the only set I have on this computer, so it’s probably going to be next week until I can start getting the other Iroshizuku reviews up. As if that weren’t enough, I’m a grad student, and I’ve got grad work that is taking a lot of time right now. I’m so sorry about this, but sometimes life just happens, and it’s happening to me at an astonishing rate! 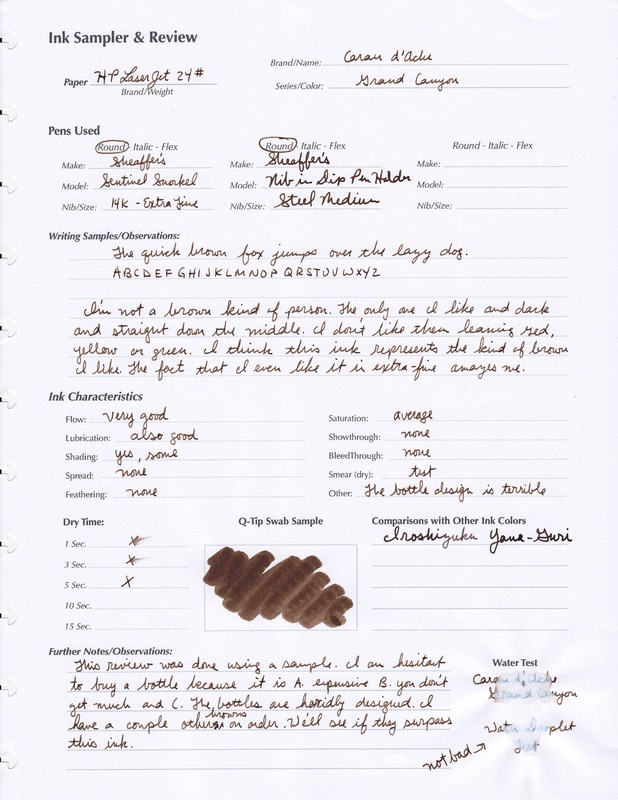 Iroshizuku Yama Guri (YG) and CdA Grand Canyon (GC) are the two browns that are responsible for my present love affair with brown ink. Now, you might be saying to yourself that these two inks are quite different. Well, yes they are, but hear me out! I still think GC can be a wonderful alternative to YG. Sure, there are inks that are a little closer in color, but they don’t come close to Iroshi’s behavior characteristics. 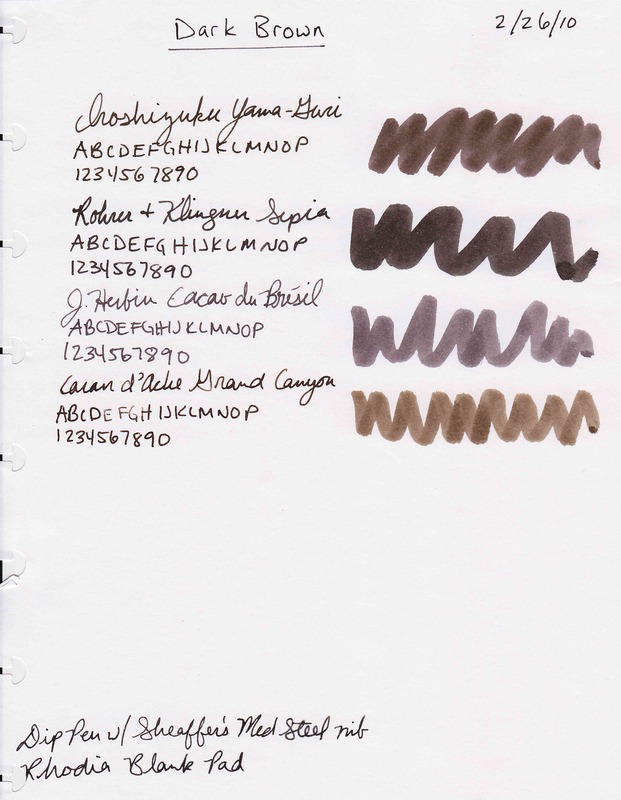 CdA inks are some of the only inks that can go toe to toe with Iroshizuku behavior. It’s the behavior similarities that make GC the perfect alternative for me. Here’s the thing though, if I’m honest, I actually like Grand Canyon Brown more than Yama Guri. Yes YG is a wonderful ink, yes the behavior is fabulous, but there is still something missing for me. GC has that something I’m looking for. What’s more, GC is every bit as well behaved. At their retail prices both are approximately $1.67 per ml. However, in terms of initial upfront cost the Caran d’Ache is more affordable even though you pay the same price per ml in the end. 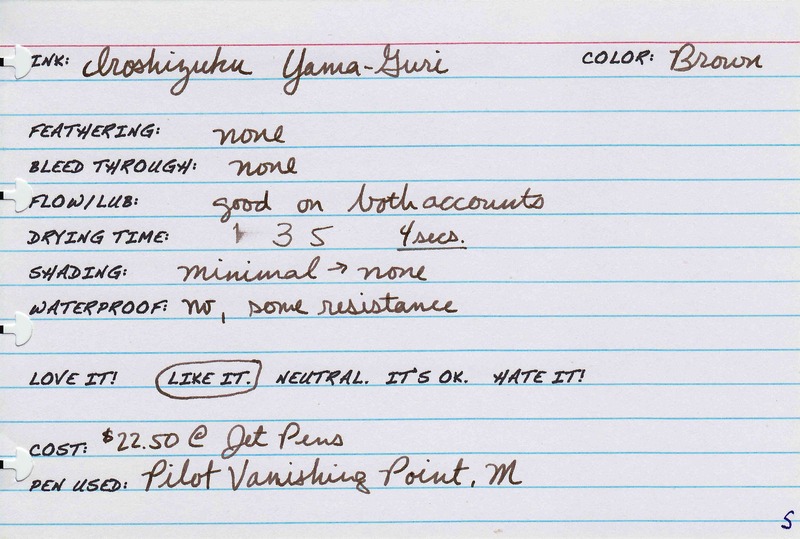 At the end of the review I list other inks that come pretty close to Yama Guri at a much lower price per ml. But, honestly, I’m never going to get through 50ml of this ink. I have SO many bottles/samples of inks and several other browns. I can’t even hope to get through 30ml of it, so that makes the price per ml even less relevant for me. So if, like me, you are more concerned with the upfront cost as opposed to the cost per ml, then Caran d’Ache is a good alternative. I am digging on the Grand Canyon! Thanks for bringing that up. I thought I mentioned it in the post, but I guess I did not. Again, thanks for bring that up. It is an excellent point that I should have covered in the review. Also, thanks for reading The Dizzy Pen! Thanks for this comparison, it’s exactly what i was looking for! I just discovered that my CdA Grand Canyon has turned green! I believe it happened while the ink sat in my TWSBI Vac-700, something might have reacted with it. Did you ever figure out why that happens? I saw your post on FPN and now I’m very curious, and somewhat displeased..